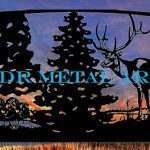 Florida Driveway Gates | Ornamental Aluminum Plasma Cut Gates - Custom Driveway Gates - Iron Steel & Aluminum - JDR Metal Art - FREE Standard Shipping! 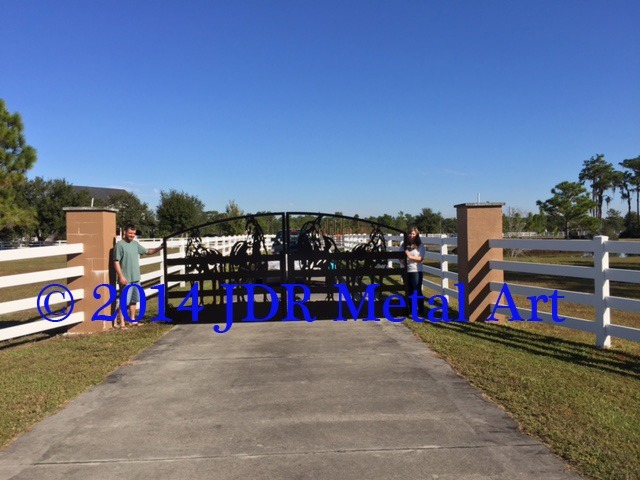 We designed & built these ornamental Florida driveway gates from aluminum here at JDR Metal Art. Each side of the gate features four plasma cut horses standing at a fence in front of a beautiful Sarasota, Florida horse farm. Our relationship with these customers began when they reached out to us about our custom plasma cut gate design capabilities in early 2014. As often happens with fully custom projects, the early stages of the design process can take some time to work through as different ideas come to mind and much thought and consideration is often invested by the customer in creating their new gate entrance. In this case the clients first sent us pictures and measurements of their entrance. We worked back and forth to refine the design to fit their farm theme. By the time summer arrived our clients were ready to begin the fabrication stage. Around the same time they also contracted with Liberty Gates owner Ian McPherson to handle the gate installation locally. 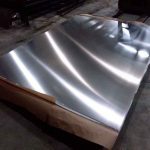 Ian brought to our clients attention that aluminum would fare much better than steel in the corrosive local Florida environment. The clients followed Ian’s advice and requested their gates to be built from aluminum. We began building the aluminum gates in September. We built the frame with 2″ square tubing 1/8″ thick wall aluminum . The canvas is 3/16″ aluminum sheet. In October fabrication was completed and the gates were then powder coated to a baked finish using a “super durable” grade semi-gloss black powder coat to finish the product. Super durable grade powder coat is formulated especially for outdoor products that will be exposed to the intense sunlight and moisture exposure of the Florida environment. Therefore, the gates will not only remain rust free thanks to the aluminum but they will also exhibit long lasting gloss retention and durability. The aluminum proved to be more expensive and harder to work with but turned out great in the end! We are confident that these customers will get a lifetime of enjoyment from their new Florida driveway gates!